So in this way, it was born an exciting project that allowed me to show in a web support the bursting and creative world that had grown on me after so many years of costuril lethargy and coinciding with a hormonal and creating bustle that took place inside of me and that ended up in another delivery: my sweet daughter Floreta. 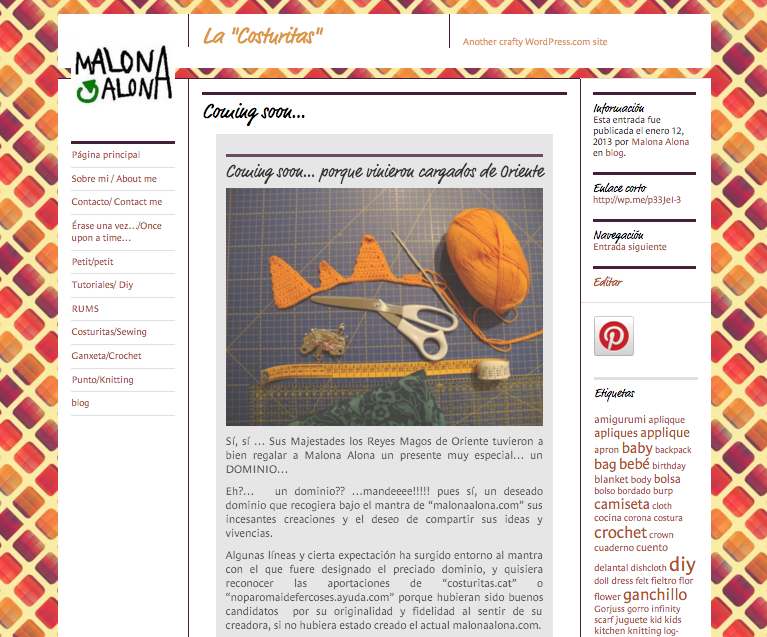 I do not know if it was coincidence or twist of fate but three years later I find myself again in a similar frame of mind, wanting to renew my creative space giving a new view to my dear blog Malona Alona, and including new content and new applications to it, that you’ll have opportunity to discover and enjoy in the coming months. Thousands of visitors, a growing number of followers and especially the affection of all those who have valued throughout all this time my work through their comments, their views and proposals for awards bloggers despite my reluctance to the latter. They have been and are an incentive to continue working to offer my interpretation of the world through “costuril world”. That’s why I’m celebrating, because they have been three great years sharing a passion with other Costuritas, receiving and encouraging ideas. 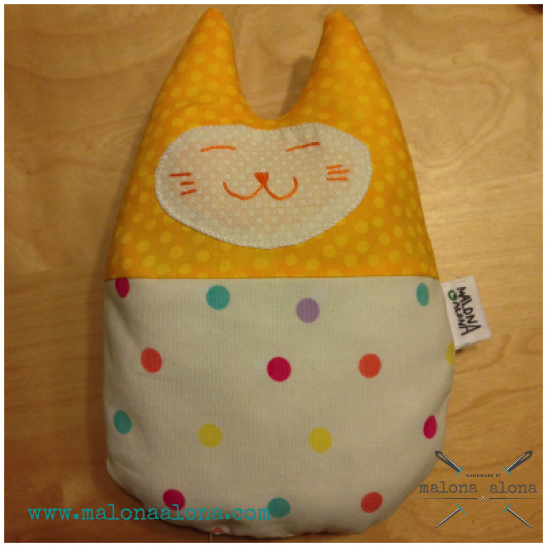 So besides blowing candles, asking 3 wishes and tasting a delicious cake that we have done at home with our little Floreta, I want to continue celebrating with you and draw between all of you a surprise: A kitten DORA sewn for the occasion. DORA was one of my first creations, in fact this is the model 202 out of Dora Series 200. It will wear a first original label logo so lovingly designed for my blog in its beginings, as it soon will change to the new logo that you can see in this new website. DORA will be hugged by the winner of the draw and receive its warm, as the seeds inside it will delight the chillier ;). what is the post that you like best of 2015 and why? what would you prefer that Malona Alona enhanced this 2016? If you are interested in what you have browsed in my blog you can always follow it through subscription, and now also via Facebook, Google+, Twitter, Pinterest and Instagram. I do not want to say goodbye without sincerely thank you again your company all this time. I look forward to continue enjoying it for many years more but also being able to allow you to enjoy my “costuritas”, stories and all those things comes to my mind. So as they say around here … PER molts ANYS !!! qué es lo que te gustaría que Malona Alona potenciara durante este año 2016. No quisiera despedirme sin agradeceros de nuevo y sinceramente vuestra compañía en todo este tiempo. Espero seguir disfrutándola otros muchos más y cómo no haceros también disfrutar con mis costuritas, historias y eso que se me pasa por la cabeza. Así que como dicen por aquí… PER MOLTS ANYS!!! Si te interesa lo que has ojeado en mi blog siempre puedes seguirme mediante subscripción en el blog, y ahora además a través Facebook, Google+, Twitter, Pinterest e Instagram.